TerniEnergia – Page 14 – . : Italeaf Group – Innovation To Make The Change :. TerniEnergia SpA, a company active in the fields of renewable energy, energy efficiency and waste management, listed on the Star segment of Borsa Italiana, and Italeaf, the first Italian company builder and holding company, majority shareholder of TerniEnergia, signed an investment agreement for the acquisition of 100% of the share capital of Free Energia S.p.A. with the representative shareholders of the Company who acted also on behalf of some remaining shareholders of Free Energia. “The acquisition of Free Energia is a strategic objective for TerniEnergia, which is integrating downstream the energy value chain. In particular, TerniEnergia is adding to its core activities (renewable power generation, guaranteed by the fully-owned photovoltaic assets, and industrial scale energy efficiency, through the subsidiary Lucos Alternative Energies) the new business of electricity trading for energy-intensive customers and consolidated re-sellers and of smart energy services, in a fast growing phase and with significant growth opportunities, due to the possibility of integration between the electric utility industry and the digital one. This transaction creates one of the most important Italian independent groups, active in the integrated business of renewable energy, energy efficiency and waste management. The acquisition also meets several strategic targets of TerniEnergia, as the significant increase and diversification of the Group’s revenues, the enlargement of the scope of core activities, with the integration in the value chain of technological innovative services, the enrichment of the portfolio with a valuable brand, which grew more than the market average in a very competitive cathegory and, finally, the opportunity to develop strong cross-selling business opportunities in the fields of energy efficiency and energy sales. Finally, TerniEnergia is entering into the promising market of the management and sale of services to vegetable oil burning power plants, where Free Energia aims to achieve the national leadership”. “As a result of the respective due diligence activities, we met all the requirements, forming the assumptions of the transaction, related to the development opportunities of Free Energia. Being part of TerniEnergia Group, is for Free Energia a great opportunity to increase the value, in terms of financial and operational, of our activity and to bring our services to an higher level in existing markets and expand in emerging markets. It is quite clear, in fact, the opportunity to create a global and evolved platform to maximize the economic returns associated with the integrated activities of production, management and sale of energy, thanks to the actual strong expansion of commercial network dedicated to the energy saving services. Free Energia will be able to use all the financial and operational synergies to plan a growth strategy focused on developing business highly complementary to those of TerniEnergia“. Free Energy, a company that in 2013 had revenues for Euro 100 million, and that in the first half of 2014 recorded a turnover of € 85 million, with an EBITDA of 3.5 million, operates as an innovative energy trader, with 1.3 TWh of electricity delivered to energy-intensive customers and/or consolidated re-sellers. 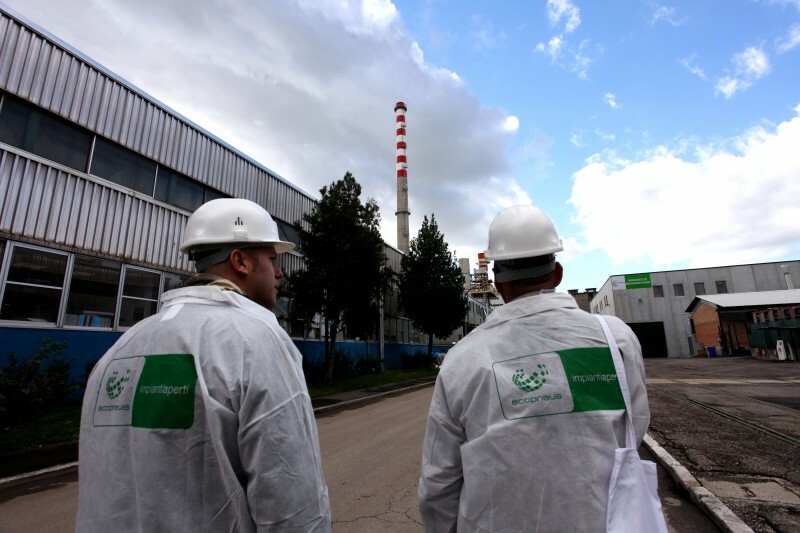 Notably, through its subsidiaries Feed and Enersoft, Free Energy is active in trading, brokerage and management of electricity and gas; in the design, construction and installation of industrial plants and provision of related services and maintenance; in the services dedicated to producers of energy from renewable sources, to optimize the profitability conditions of the plants, including through the sale of vegetable and sustainable oil; in the consultancy field of pricing strategies, recovery and energy savings; in the in-house designing, implementation and management of services and remote control systems and in the development of innovative software for the energy sector. Free Energia offers a variety of value-added integrated services for companies producing renewable energy, which normally move only on the power generation. The management system is based on an integrated package of services conveyed through a platform in-house built. Organized in a simple and flexible way, Free Energia is able to seize the opportunities of a market characterized by rapid and complex changes, succeeding to meet the energy needs of its customers. The structure of the transaction will consist of a capital increase of TerniEnergia, reserved to shareholders of Free Energia to be subscribed through the contribution of Free Energia shares. There is no cash outlay. The transaction closing is subject to certain conditions precedent including the positive pronouncement of certain entities including banks and bondholders of the Companies; the authorization by Consob to publish the prospectus for the TerniEnergia Shares to be issued against the capital increase; the approval by the TerniEnergia extraordinary Shareholders Meeting of the Capital Increase to be subscribed by contribution of shares. All the conditions precedent have to occur by no later than December 31st, 2014. As a result of the signing of the investment agreement, TerniEnergia is going to prepare a new consolidated business plan that takes into account the integration of Free Energia activities with those of TerniEnergia and its group of subsidiaries. TerniEnergia is assisted by Power Capital, as financial advisor in the transaction. Francesca Ricci, of the law firm Predieri Ricci, and Federica Pomero, Daria Pastore and Antonella Calogiuri, of the law firm Legance, assisted respectively TerniEnergia and Free Energia and its reference shareholders as legal advisors. “The first quarter of 2014 results represent a snapshot of the evolutive path of the Group, with a return to revenue and margins growth, reflecting the correctness of the strategic choices in the direction of business internationalization and diversification. This confirms the important contribution generated by the performance of the assets dedicated to power generation owned by the Group, which contributes to the results of the quarter together with the good performance of environmental and O&M activities. TerniEnergia, thanks to the scenarios opened by the agreement signed with Al Hamed Group in the Gulf countries and the one signed with Free Energy for the start of the negotiation for the acquisition, looks into the prospects for the medium term with growing optimism. In particular, the Company aims to strengthen its internationalization process and to restart a growth path in Italy, especially in the dynamic sectors of smart energy and energy efficiency. Alongside the strategic opportunities that will lead to the development of a new business plan, to be defined after the desirable successful conclusion of the transaction with Free Energia and the acquisition of 100% of the shares of Lucos Alternative Energies, high visibility for the Group’s industrial activities is guaranteed by major orders at startup in South Africa and the planned construction of new environmental plants in Italy”. The Net revenues amounted to Euro 10.4 million, with an increase of 19.8% compared to March 31, 2013 (Euro 8.7 million), thanks to the internationalization of the EPC PV activities, and in particular to the remarkable state of advance of the first plant built in South Africa in the area of ​​Upington and the fees paid by the customer for the business of design and other preparatory activities carried out on two industrial sized photovoltaic plants that will be built in South Africa too. Also an increase in revenues is guaranteed by the management of the photovoltaic assets (power generation) and by the business lines of environmental activities (recovery of materials and energy from marginal resources) and the Operation and maintenance activities. The gross operating margin (EBITDA) amounted to Euro 4.6 million (Euro 1.1 million at 31/03/2013), with an increase attributable mainly to the activity of power generation and the results of the activities of the environmental sector. The high margin includes the fees paid by the customer for the design activities and for further preparatory work carried out on the two industrial sized photovoltaic plants that will be built in South Africa. The EBITDA margin was 43.9%, with a significant improvement compared to 13.1% at March 31, 2013. Net operating income (EBIT ) amounted to Euro 2.8 million (Euro 0.2 million at March 31, 2013), after amortization of Euro 1.8 million (Euro 1 million in 2013), the increase of which is determined by the largest number plants held in full ownership by the Group. Net profit amounted to € 0.7 million, compared to Euro 1.6 million at March 31, 2013. The Net Financial Position amounted to Euro 144.6 million (Euro 135.2 million at 31/12/2013). The non-current net financial position is Euro 139.7 million, while the net financial position in the short amounted to EUR 4.8 million. The increase in the net financial position, partially offset by a decrease of the current financial debt, is closely related to the bond issue carried out in February 2014. The net equity amounted to Euro 53.6 million (Euro 53.9 million at 31/12/2013), while the Fixed Assets amounted to Euro 184.7 million (182.4 million up to 31/12/2013 1.3%), of which € 159.7 million related to tangible fixed assets. The NFP short /net equity ratio, equal to 0.09x improves appreciably and constantly, consolidated in full security area (0.34 x at 31/12/2013). The Board of Directors has reviewed and ratified the signing of the expression of interest for the acquisition of Free Energia SpA through a capital increase of TerniEnergia, reserved to shareholders of Free Energia, to be subscribed by the transfer of shares of Free Energia. The Board has also approved the signing of the EPC contracts, supply contracts and sub-contractors agreement by the South African subsidiary TerniEnergia Project (Pty.) 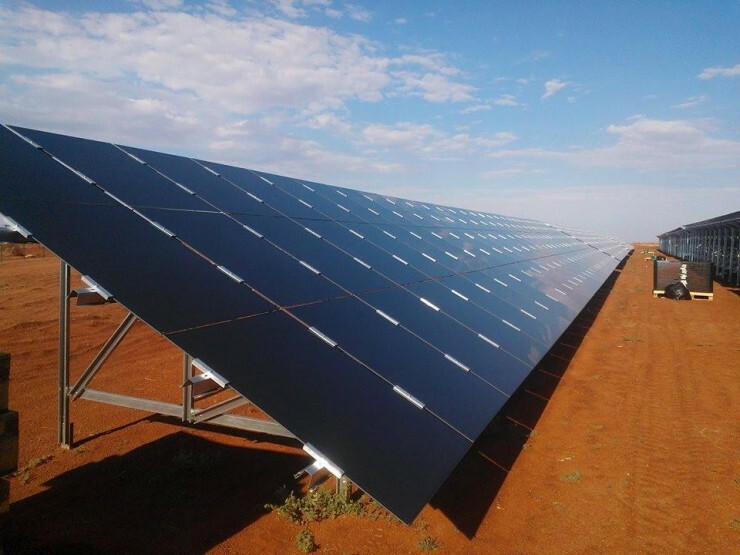 Ltd. for the construction of two solar power plants in South Africa named Tom Burke, with a total capacity of 66 MWp, and Paleisheuwel, for a total capacity of 82.5 MWp. The Board of Directors also approved the amendment to the Procedure for Transactions with Related Parties, implementing Article 12 of Consob Regulation no. 17221 dated 12/03/2010 for Transactions with Related Parties, with the approval of the Committee for Transactions with Related Parties. The Board finally approved a framework resolution concerning the issuance of bank guarantees by the parent company Italeaf SpA in the interest of TerniEnergia SpA in favor of lenders of the Company, for a cumulative maximum expected amount in one year amounted to Euro 4 million. TerniEnergia has substantially finished and connected to the grid a photovoltaic plant of industrial size, for a total installed capacity of 10 MWp in Upington – South Africa, made on behalf of a third party customer, in particular for a utility of international concern and its special purpose vehicle. The total number of photovoltaic systems built by TerniEnergia from the beginning of its activity is equal to 273, with an aggregate capacity of approximately 284.1 MWp (34.3 MWp in full ownership and 4.1 MWp in joint venture for the Power Generation activity). Moreover, are connected to the grid biomass plants for a total of 1.5 MWe and 2 MWt. April 23, 2014: The Shareholders’ meeting of TerniEnergia approved unanimously the draft financial statements and noted the presentation of the consolidated financial statements as at December 31, 2013. Shareholders’ meeting also approved the distribution of a dividend equal to Euro 0.06 per ordinary share gross with-holdings set forth by law. The dividend shall be paid on May 22, 2014 and the relevant coupon no. 5 shall be separated on May 19, 2014. The Shareholders’ Meeting has finally approved the confirmation as a non-executive director of Atty. Francesca Ricci, co-opted to the Board of Directors on October 17, 2013 in observance of the provisions introduced by Law n. 120 July 12, 2011, in matter of gender balance in the composition of the Board of Directors and the Statutory Auditors. April 24, 2014: TerniEnergia and Italeaf, a holding company and majority shareholder of TerniEnergia, signed a manifestation of interest for the acquisition of 100% of the share capital of Free Energia S.p.A. with the shareholders of the Company. Free Energia, a company that in 2013 had revenues of approximately Euro 100 million and that in the first quarter of 2014 and recorded a revenue growth of +100% compared to the previous financial year, as an innovative energy trader, providing energy to electricity-consumptive customers and/or consolidated re-seller but, more importantly, carrying out hedging and trading planning with innovative technologies. The structure of the transaction, if will occur the conditions for a final settlement, will consist of a capital increase of TerniEnergia, reserved to shareholders of Free Energia, to subscribe through the transfer of shares to Free Energia. There is no cash outlay. The estimated value of the transaction is approximately 15 million Euros. April 29, 2014: TerniEnergia has signed a joint venture agreement in Abu Dhabi for the establishment of a NewCo with Khalid Al Hamed Group LLC Dubai, represented by the Chairman and CEO Sheikh Khalid Bin Ahmed Al Hamed. In particular, TerniEnergia has signed a binding and immediately operative agreement between the parties, that provides for the establishment of a company named TerniEnergia Gulf LLC, based in Abu Dhabi, which is 51% owned by Khalid Al Hamed Group LLC and 49% by TerniEnergia, which will operate in the Middle East and the Gulf Cooperation Council (GCC). The current market situation is characterized by strong global growth of investments in the photovoltaic industry and the environment, but there are critical issues arising from the ventilated modification of Italian regulatory system and incentives for renewable energy sources, the quota restrictions on access to capital, the growth of the size of the plants and the consequent need for a careful and prospective view of financial management of projects. Because of this changing market, TerniEnergia has diversified its sources of access to capital through the bond issue, has revised its business model from which derives stability of cash flow and growth opportunities resulting from replicability, has diversified the risk country and the counterparty in B2B. At the same time, precisely because of the rumors of the development of legal and regulatory framework, the Company has had to deal with a delay in fund rasing for the projected closed real estate investment fund, taking the opportunity to consolidate the full ownership of the photovoltaic assets for the power generation activity, increasing its assets and maintaining a bouquet of assets, with very high margins, to be valued in the event of future opportunities resulting in a reduction of the NFP. TerniEnergia confirms, therefore, for the future, a strategy that combines the size of the business, growth and development policy of relations with capital markets and debt. • International Development – In the period 2014/2015 is planned the construction of the project in portfolio in South Africa for an amount of approximately Euro 140 million; in the short term it is planned to establish a company in partnership with Al Hamed Group, named TerniEnergia Gulf LLC, headquartered in Abu Dhabi, active in the fields of power generation, waste to energy and waste management. By 2014 it is expected to open the first sites and the construction of a plant for the recovery of end of life tires. • Italian Development – Strengthening in the growing sectors of smart energy and energy efficiency. In particular, the beginning of negotiations for the acquisition of Free Energia SpA allow a completion of the value chain downstream for power generation plants owned by TerniEnergia, thanks to the sales network of Free Energia. The operation, thanks to the simultaneous acquisition of 100% of Lucos Alternative Energies, already contracted for next June, will allow strong potential synergies and opportunities for the integration of the business, which will be the basis for a strong growth in energy efficiency and enhancement of energy production from renewable sources. • Strategic development – Focus on business lines with major development, consolidating investments without recourse to new lines of business with lower potential return and growth, where the recent development (EPC, O&M) was based. Concentration on the activity of power generation with the full technological independence and diversification of sources and technologies themselves, to enhance the opportunities for the short term and the coverage requirements of the demand curve. TerniEnergia intends to have a balanced portfolio for each Country in the process of internationalization of PV EPC and environmental business. In particular, continues to conduct intensive scouting activities to promote development projects in the most attractive countries for the installation of large-scale plants. The Company will also continue the process of strengthening the scope of the environmental asset, completing a new facility for the treatment and recovery of “secondary raw material” of life tires in Northern Italy and exploiting a new plant in South Italy for energy recovery through anaerobic biodigestion and composting. 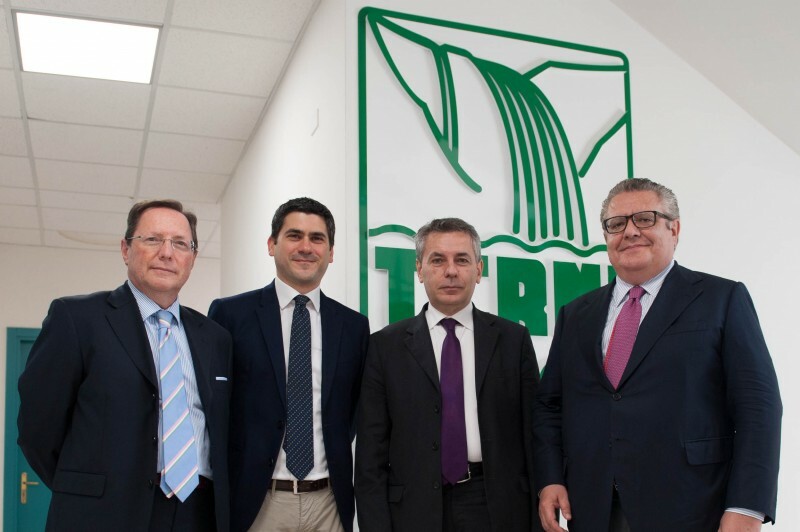 Finally, the new plant for the treatment of industrial waste fluids in Nera Montoro (TR), now in an advanced authorization phase, will be completed and will intercept a substantial demand in a market segment with high technological content and high growth prospects. On the financial side, TerniEnergia intends to consolidate the excellent reputation with investors through its own presence on the Stock Exchange in order to candidate itself to be an investment platform for institutional investors, creating conditions, through the stability of cash flows, using the debt in a efficient manner with respect to changes in demand of the market. The Officer appointed for the preparation of accounting and corporate documents, Dr. Paolo Allegretti, states, pursuant to paragraph 2 of art. 154-bis of the consolidated Financial Act, that the accounting information that is contained in this press release corresponds to the results contained in the documents, books, and accounting records. Pursuant to art. 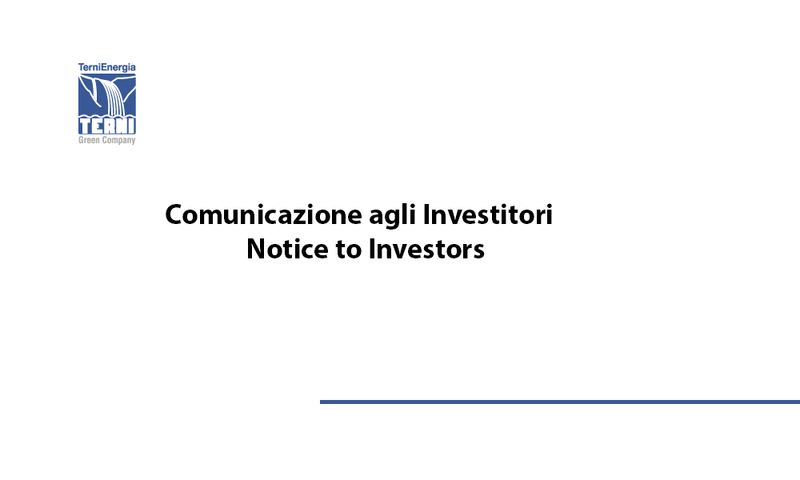 2.6.2 of the Rules of Borsa Italian SpA, TerniEnergia announced that, in addition to what is stated in the Calendar of Corporate Events 2014 released last February 6, the Board of Directors for approval the approval of the interim management statement on 31/03 / 2014 will be held on May 14, 2014.